TouchPoint software not only has a secure Check-In for classes and events, it also has a Building Check-In mode. This uses the standard TouchPoint Check-In software, which you download onto the computer you will use. And it also requires that your system admin create a .txt file in Special Content, and that you have a Status Flag saved search that is used to determine who can check into the building. This article walks you through setting up Check-In to use in a building. See the following help article for a fuller explanation of how Building Check-In works for those checking in as well as for the attendant at the check-in desk. This search will be used in the text file and will determine who can check into the building as a ‘member’. You will save the search as a Status Flag. Create a new search, adding the conditions you want as qualifiers for someone to check into the building. This search is using a Standard Extra Value named Building Access. See Extra Value for more details in using this. Save your search using this naming convention in order to save it as a Status Flag The name first contains the letter F followed by 2 digits from 01 to 99, then followed by a colon and then the display name of the status flag. The only part of the Status Flag name that will be entered in the Text File (see below), is the letter F and the 2 digits - F30 . Continue below creating the Text File using the Status Flag name for the search you just created. Your System Admin must be the one to create this. Go to Administration > Special Content > Text Content and select the tab Text Content . Then click the green + New Text File button. Enter the name exactly as this: BuildingCheckin-recreation.xml . Then click Submit . If you want to use something other than recreation, you can do so. Just replace recreation in the name with whatever you want to use, and leave the rest of the name as you see it above. The part of the name that will be used when you open the Check-In software will be just recreation . Copy the text below and paste it into the text box. The text contains the name of the type of building Check-In, which is recreation . It also indicates that the requirement for checking in is based on a Saved Search that is a Status Flag (querybit) named F30 , and that the Members are allowed to check-in a maximum of 2 guests . Make any necessary changes to the file based on what you named your Status Flag saved search. If yours is named something different, enter that where you see F30 . The Status Flag (querybit) uses only the letter F followed by the number, not a colon or the entire name of the Status Flag. Change the number of maxguests if you want to allow anything other than 2. Our sample text includes Aerobics, Equipment, Gym, and Track as the options one will see when checking in. Change just that part of the text to whatever you need. Do not change <Activity> or </Activity>. Just replace the actual activity name with what you need. If there are more than you need, delete one row of the activities. If you need more, insert a row and use the same format to create a new activity in the list. Once you have edited the text and are satisifed that is it what you want, click Save Content . Download and install TouchPoint Check-In software on the computer you will use for Building Check-In. Download and install Check-In directly onto the computer you will be using. You will want one computer with two monitors. One monitor will be a normal monitor for the attendant behind the desk. The other monitor will be a touchscreen monitor that will be used by those checking in. When installing Check-In use the monitor attached to the computer, not the touchscreen monitor. 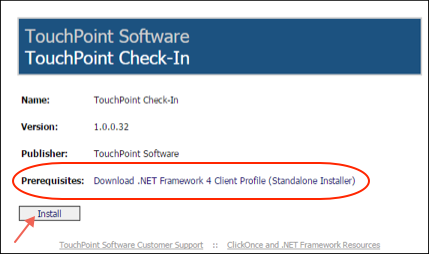 Click HERE to download and install the TouchPoint Check-In software on your PC. When you see the image below, click the Install button. If you do not have the minimum requirements relating to the .NET Framework, click the link to download the prerequisites (see image above). This could take about 20 minutes to download and install the .NET Framework. Windows 10 Operating System will already have this installed. If Check-In does not open automatically, look in the bottom left corner of the browser, click the arrow, and click Open . This is how it works on Chrome. When (if) you see an Application Install - Security Warning, click the Install button in that dialog box. Edge will open the security warning immediately. You will see the installation progress, and the application should open when it finishes, allowing you to log in. A shortcut for TouchPoint Check-In should automatically get added to your desktop. If you do not see a shortcut, you can add it yourself. Log in. If Check-In did not automatically open, just click the shortcut to open it. 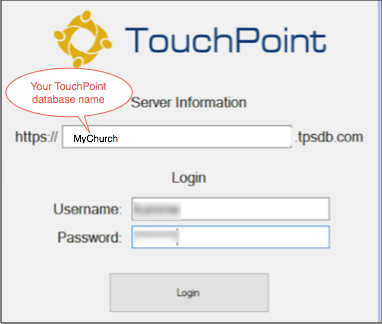 Enter the name of your church’s TouchPoint database. The prefix and the URL ending are already there, so you do not need to include those. Enter the username and password for the user record you are using for your Check-In computers and log in. That user must have the role checkin . On the Settings page for Check-In, under Building Check-In , select the box Building Mode , and enter the name you used for your text file. It is probably recreation . Also, under Admin Options , set the Admin PIN number and enter the PIN Timeout seconds. None of the other settings apply to Building Check-In. If you want your attendant to see both screen as the same time on their monitor, you can, under Other Options uncheck the box Full Screen , and Hide Cursor . You are viewing the screen for the attendant. Click Show Check-In . This should display the keypad screen on the touchscreen monitor. If not, you may need to ‘drag’ it off the main screen, so that it displays on the touchscreen. For details about how this type of Check-In works, see our other help article that outlines the process. When a Note is saved in Building Check-In, it will create an Ad Hoc Extra Value on the person’s record. In order to better control who sees that note, we recommend that you first create a Standard Extra Value in your database. This allows you to set a Visibility Role, limiting which users can see it and/or edit it on the person’s people record. The section below instructs you to create a new user role, name it the same as your Text File, and to use that role to protect the Extra Value that will contain the notes. However, if you prefer, you can use an existing user role; and, when you create the Standard Extra Value, use that role as the Visibility Role. Using a role that is the same name as your Check-In, is a way to link all of that together. However, it is your choice. Remember: Either way you go regarding the user role, the name of the Extra Value must use the name of the Text File. If you have decided to use an existing role to protect the Standard Extra Value, then skip this section. Create a new user role with the name that matches the name you used when creating the Text File. If you named the file recreation , that is what you name the user role. It is case-sensitive. Assign that role to everyone that should be able to view (and edit, if necessary) the Extra Value note on a person’s people record. New Users And Roles See the section Add a New Role . Create a Standard Extra Value with the name that matches the name you used when creating the Text File with -notes as part of the name. If you named the file recreation , then the Extra Value will be named recreation-notes . It is case-sensitive. The Type should be Multi-Line Text . Set the Visiblity Role by selecting the role you created above, in order to protect it. Or, if you decided to use an existing role, select it. Then only those with that role can view the Extra Value. 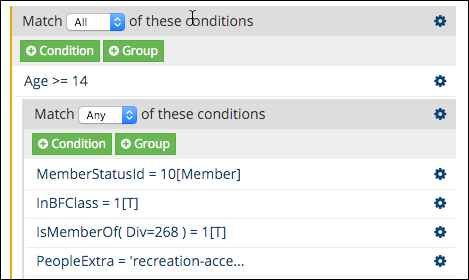 You can create a Standard Extra Value to be included as a condition in your Status Flag saved search. You would use this if you need to give access to people who will not fit the criteria in your search. Name it Building Access (or something similar). You will set the value to true for anyone that needs access is not included in your search results. Making it a Standard Extra Value means that it will display on every people record in your database. It does not come into play until you give it a value. You can also use this to block someone from having access to check in, by setting the value to false . This would be used for someone who would normally have access based on your saved search, but, for some reason, needs to be prevented from coming into the building. If you want to allow a guest to come without a member (or someone having building access), you can add this to your text file, on the line where you see querybits . The text is maxvisits=”5” . Separate it from the other text with a space. Of course, you can change that to whatever number of visits you want to allow before a guest must come with a member. After they reach the maximum number of visits you have allotted, they would no longer be able to check in unless they were a guest of a member. The purpose of this is to allow someone to use the building even if they do not know a member. A staff member would then make an effort to connect with that person, perhaps while they are in the building. The goal would be to get them involved in a Life Group, where the members of the class could further minister to that person. There is a Search Builder Condition named CheckinVisits , that helps you find people based on how many unaccompanied visits they have made. You would combine that condition with one that specifies that they do not have the Status Flag that you use for building access.